Jacqueline Winspear excels at re-creating the feel of the time period. Reading this - and every Maisie Dobbs book so far - I've felt immersed in post World War I England. Nothing, absolutely nothing rings false or anachronistic. Masterfully done. 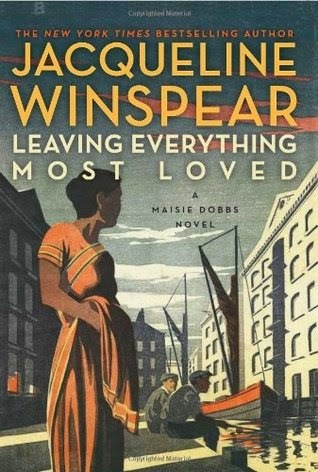 Leaving Everything Most Loved adds some additional nuance to Maisie's world, opening a window into the struggles of Indian immigrants in London during the 1930s. The discrimination and prejudice, sometimes subtle, sometimes blatant, are shown in realistic ways, neither sugar-coating, nor reveling in the hatred. I also appreciated Maisie's frank survey of her "several threads of reticence" to marrying James Compton, including the long-lived effects of her experiences during the war. But more than anything, Maisie had established within herself a strength, a sense of her own worth, and an independence. At the same time, though she had long recovered form the wounds of war--wounds of both body and mind--there were times when the ice still felt thing beneath her feet, and she retained a fear that she might crash through into the cold waters of her most terrible memories if events conspired to make her fall. She feared that in marrying she might give up that essential part of herself, the resilience that kept her skating above the ice. The Maisie Dobbs series calms me. The rhythm of the words, Maisie's calmness, slow me down and help me truly absorb every word. I'm looking forward to the next installment.